LIKE any serious Lebanese homemaker, Hazel Yared never fails to have a table of handmade delicacies ready for any stranger who walks through her door. The day she’s scheduled to have an interview with The Catholic Leader, her dining table is decorated with dainty Lebanese shortbread, walnut slices, almond-and-chocolate biscuits, ham-and-cheese sandwiches, and an endless offering of tea or coffee. Nothing about this form of Lebanese hospitality is out of the ordinary except the fact it was all personally prepared by a 100-year-old grandmother crippled with arthritis. “They all say, ‘You’re an inspiration’,” Hazel said. “All I know is baking is a pleasure to me. “I cook all my own food. After the interview is over, Hazel will pull out her dinner, a Lebanese dish of beans, rice and vermicelli noodles that she prepared the night before. Half of it has already gone to a married couple in the neighbourhood, proving again that Lebanese hospitality hasn’t perished with her old age. “His wife works and he works, so I said every Wednesday I’ll cook this meal and I give him half,” Hazel said. Not long ago Hazel was in the middle of baking a batch of one of her delicious biscuits for her niece to give to the hospitality group at Mt Carmel Church, Coorparoo, when the phone rang. It was her 91-year-old sister calling just to say hello. “I said, ‘I haven’t got time, I’m baking some biscuits’,” Hazel recalled. But the highly independent centenarian can’t see herself in a nursing home – she manages perfectly in her three-bedroom unit in Coorparoo where she lives with her full-time carer and third son Allan. Her parish of 30 years, St James Church, Coorparoo, is just down the road, and every weekend Hazel puts on her Sunday best ready for her son to take her to Mass. She walks using only a wooden cane, and is known to stroll up and down her unit’s tight balcony about 20 times a day. Not surprising, she rarely eats out, preferring to cook her own meals in her home kitchen. Casseroles are her favourite meals for dinner, and they always come with loads of onions. “We’re onion eaters here,” Hazel said. “I have been eighty-nine years peeling onions. “I used to peel onions when my sister was looking after us, when we were living in Brisbane, and she’d say to me, ‘When you come home from school, I want two onions peeled, we’re making steak and onions’ and I had to peel the onions. Good food is, according to Hazel, the secret to living to 100. “I think the secret is good food,” Hazel said. “I eat a lot of salad, lettuce, vegetables. “I’m not a meat eater, I know that, though I used to be. “Since I’ve come to Brisbane I can’t find any tender meat. “Even scotch fillets are tough. Hazel is used to braving the tough things in life. After receiving a scholarship to study at All Hallows’ School when she was 11 years old, her dad pulled her out of school two years later and propped her on the family farm in Maroochydore. The farm had no electricity and no running water, but had plenty of wood for her stove and copper boiler, which she used to wash the family’s clothes. “And I stayed there for three-and-a-half years,” Hazel said. Fortunately Hazel’s sister had a lifeline – she ran a little drapery shop in Chinchilla that her dad bought as a potential business. “So my brother got another man in and he took my place and I went to work with my sister in the shop,” Hazel said. Hazel spent a few years in Chinchilla before her father met a young man from Maryborough who was, to him, the perfect match for his daughter. At the last minute the young man was invited over for dinner to meet his future wife. “And Dad made a Lebanese dish or something,” Hazel said. “He said, ‘Oh, you’ll like him, don’t worry about that’. “I said, ‘Yes, he’s a nice Italian’. “’Italian? All he’ll be able to give you is plenty of spaghetti. The man I’m bringing home, will treat you as a queen’. On November 5, 1940, when Hazel was 21, she married Eddie, the Lebanese suitor, and moved to Maryborough where they lived for nearly 50 years, raising four sons. “That was it,” Hazel said. In 1988 the pair retired and relocated to Brisbane where she has called home for 30 years. In that same year Hazel began the hobby for which she’s probably best known in Brisbane – winning bridge and solo at the Cathedral Coffee Lounge. Twice a week since 1988 Hazel has played cards at the coffee lounge with the other “cards girls” but she’s definitely the oldest. “Oh, the oldest player and the only one with the dyed hair,” Hazel said. 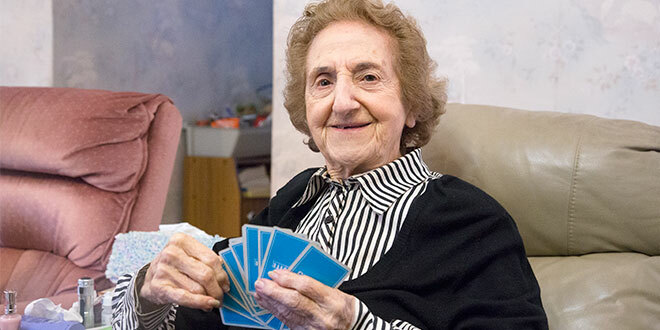 A serious accident that landed Hazel in hospital for four weeks with cardiac arrest has kept her from playing a winning hand for some months. She says she’s itching to get back to the city for a game with the card ladies. “I can’t wait to get back to cards,” Hazel said. She might even bring one of her delicious Lebanese shortbreads to her next game.